HOME > News > Results of the "International Symposium on Ocean Acidification -Dialogues between scientists and stakeholders-"
With the development of scientific research in recent years, the issues of ocean warming and acidification have been attracting attention internationally from the perspective of policymaking. This is especially true with regards to the 17 Sustainable Development Goals (SDGs) in the 2030 Agenda for Sustainable Development, where Target 14.3 of Goal 14 mentions the need to "Minimize and address the impacts of ocean acidification, including through enhanced scientific cooperation at all levels," establishing the importance of addressing the issues and highlighting the need for specific adaptation measures.In response to these issues, the Ocean Policy Research Institute of the Sasakawa Peace Foundation (OPRI-SPF) hosted the "International Symposium on Ocean Acidification -Dialogues between scientists and stakeholders-" on October 28, 2018※.Attended by about 80 participants, the symposium shared knowledge on the current situations of ocean warming and acidification, considered adaptation measures needed in future, including enhancement and networking of monitoring methods, and conducted discussions on policy in the field of ocean science. In the first session of the symposium, participants discussed the theme, "Towards the establishment of a monitoring network". 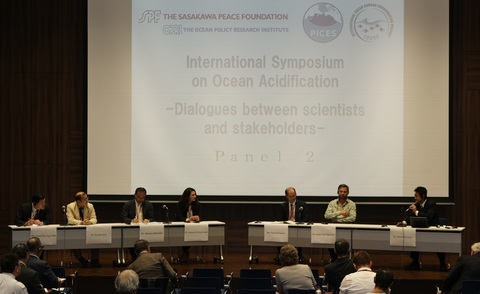 After the keynote speech about the current state of ocean acidification from Dr. Richard A. Feely (NOAA, US) and Dr. Masao Ishii (MRI-JMA), a panel discussion was conducted under the moderation of Dr. Tsuneo Ono (FRA). In the panel discussion, Dr. Naomi Harada (JAMSTEC) gave a presentation on the monitoring and acidification of the North Pacific and Polar Regions, and Dr. Kim Currie (NIWA, NZ) spoke on monitoring in coastal areas. In addition, monitoring networks and information dissemination were introduced by Dr. Jim Christian (DFO, Canada) and Dr. Macjej Telzewski (IOCCP-GOOS). Based on these presentations, participants discussed future measures, such as monitoring for assessment of biological responses in the open ocean and spatiotemporal density of the monitoring in coastal areas. During the lunch break, the preview of the clay animation, "Another CO2 problem" (Japanese dubbed version) was conducted. The second session was held on the theme, "Dialogues between scientists and stakeholders," and Dr. Jason Hall-Spencer and Mr. Toru Kumatani made keynote speeches on the CO2 Seeps of Shikine Island and the Third Basic Plan on Ocean Policy in Japan. To further deepen the discussion, Dr. Masahiko Fujii (Hokkaido Univ.) moderated the panel discussion following the keynote speeches. 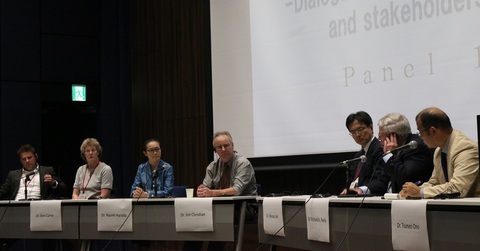 In the panel discussion, Dr. Silvana Birchenough (CEFAS, UK) gave a presentation on the impact on fishery resources, Mr. Tomohiko Tsunoda (OPRI-SPF) introduced policy proposals for the Third Basic Plan on Ocean Policy in Japan, and Mr. Masato Nobutoki (EX Research Inst.) introduced efforts by local governments. Following the introduction of the first session by Dr. Ono, participants discussed the importance of appropriate information dissemination and science-based policy making. Communication with stakeholders and the importance of education in conjunction with efforts being made in coastal areas such as "Satoumi" were also emphasized.